This richly imagined novel, set in Hawai'i more than a century ago, is an extraordinary epic of a little-known time and place---and a deeply moving testament to the resiliency of the human spirit.Rachel Kalama, a spirited seven-year-old Hawaiian girl, dreams of visiting far-off lands like her father, a merchant seaman. Then one day a rose-colored mark appears on her skin, and those dreams are stolen from her. Taken from her home and family, Rachel is sent to Kalaupapa, the quarantined leprosy settlement on the island of Moloka'i. Here her life is supposed to end---but instead she discovers it is only just beginning. 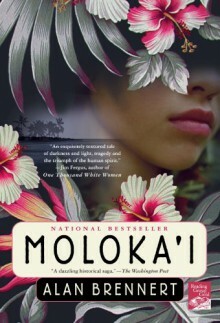 With a vibrant cast of vividly realized characters, Moloka'i is the true-to-life chronicle of a people who embraced life in the face of death. Such is the warmth, humor, and compassion of this novel that "few readers will remain unchanged by Rachel's story" (mostlyfiction.com).